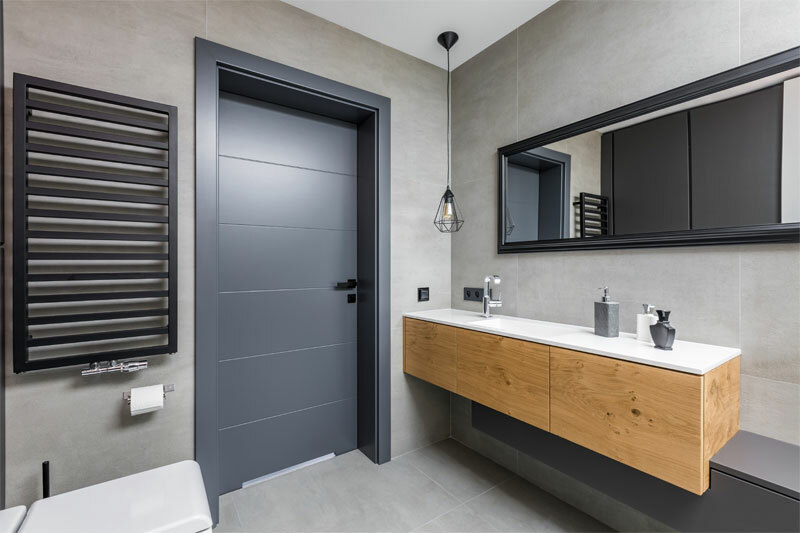 Doors may not be the first component that comes to mind when people think about bathroom renovations, but they can be one of the most impactful. Why’s that? Think of it like this: A bathroom door makes a first impression. It’s what people have to walk through before they ever get to see the unique design choices and features you’ve added to the bathroom itself. Install a stunning door, and you set the stage for wowing guests as they step inside. The door can make a dramatic impact on the room’s overall look and feel. Nothing says grand entrance like a pair of French doors leading to the bathroom. Paneled with glass, they let in light, allow open views into the bathroom and create elegant ambiance. Featuring panels of glass, these doors are arranged in various patterns or designs. Choose a modern style — such as the door with five glass rectangle panels — to pick a hot option. On trend today are sliding barn doors, available in a variety of designs and styles that fit the modern home. Typically hung on hardware that sits above the door and allows the doors to slide, these doors can add wonderful charm and value. The best part of pocket doors is how they tuck away into the wall, saving valuable floor space. When you’ve got a layout that’s short on space, pocket doors help make the most of your room. Just because panel doors are the most common interior doors doesn’t mean they’re not special. In fact, panel doors are popular for a reason. Whether you go with doors that have a single large panel or doors with several small ones, you choose a classic, versatile look with this option. For a door that creates a spacious, airy look without sacrificing privacy, there’s the frosted glass option. Frosted glass doors come in a variety of styles and help to let more light into the bathroom. Stained glass doors create a real wow factor in the bathroom, capturing the eye with intricate patterns of colored glass. These designs can be as basic as a simple repeated pattern or as ornate as a picturesque scene. Kill two birds with one stone when you opt for a mirrored bathroom door that gives you more convenience when getting ready. A door is often the perfect place to feature a tall mirror, built into the design. It maximizes space while still letting you check your outfit each morning. 1. Only buy wood doors that are treated for high humidity. If you decide to go with a wood bathroom door, you’re choosing a classic option, unrivaled for its style and beauty. Make sure, however, that the wood is treated for high humidity — otherwise, you run the risk of the door warping over time. The only time when this isn’t an issue is in a bathroom without a shower/tub. 2. Give steel a chance. While a steel door might not seem like the most intuitive bathroom choice, there are a few reasons it makes sense. Steel doors are durable — naturally resistant to water damage from condensation or humidity. More than that, though, steel doors are continually evolving, and today’s marketplace includes a variety of stylish designs worth considering. 3. Fiberglass is the typical choice. Most homeowners today go with fiberglass bathroom doors that look like wood. Fiberglass is cheaper than wood or steel, though not as durable as steel. It’s also resistant to water damage, so it can be a great bathroom option. Once you decide on the right door, complete your bathroom with products from Modern Bathroom. As the Internet’s leading resource for factory-direct pricing and up to 70 percent savings on bathroom products, Modern Bathroom is the place to go for vanities, faucets, sinks, mirrors and more. Shop our catalog online to find a wide selection of products that we ship for free to the 48 contiguous United States. Browse our site today to learn more! There’s nothing like the luxury of a spacious, renovated master bathroom. With a master bathroom makeover, you gain a private retreat for getting ready, unwinding and relaxing each day. Whether you’re dreaming about master bath ideas or are about to get started on your personal master bathroom makeover, here’s a step-by-step look at what goes into a renovation. Use these bathroom ideas to inspire your overhaul — and create the beautiful, spa-like bathroom you’ve always wanted! Before taking on any home remodeling project, it’s a good idea to know what you can afford. Generally speaking, remodels run the gamut of costs — from a small renovation that costs a few thousand dollars to a complete overhaul that’s upward of six figures. Determine your budget, and let that amount guide your remodeling efforts. When deciding which elements of the bathroom to redo, start with what’s most important to you — replacing the outdated vanity, turning the tub into a shower/tub combination, replacing the tile walls, or something else? Knowing what will have the biggest impact on the space can help you determine where to spend your money. Because floors set the foundation for the bathroom design, they’re one of the most important components. From a design standpoint, you’ll want a floor that fits your style, is timeless enough to last through changing trends, and durable enough to be easy to clean and take care of well into the future. Because this floor is going into a water-heavy room like the bathroom, however, you’ll also want an option that can withstand spills and splashes. Some good options include porcelain or ceramic tile, vinyl floors, natural stone floors, engineered wood or laminate. A standalone tub is the epitome of master bathroom luxury. Whether you go with a drop-in, alcove, corner or clawfoot option is up to you — explore the possibilities to see what you like best. Tub features you might consider incorporating include jets, bubbles, underwater LED lights, music, digital controls and/or ADA compliance. If there’s one feature that makes a huge impact in a master bathroom, it’s lighting. 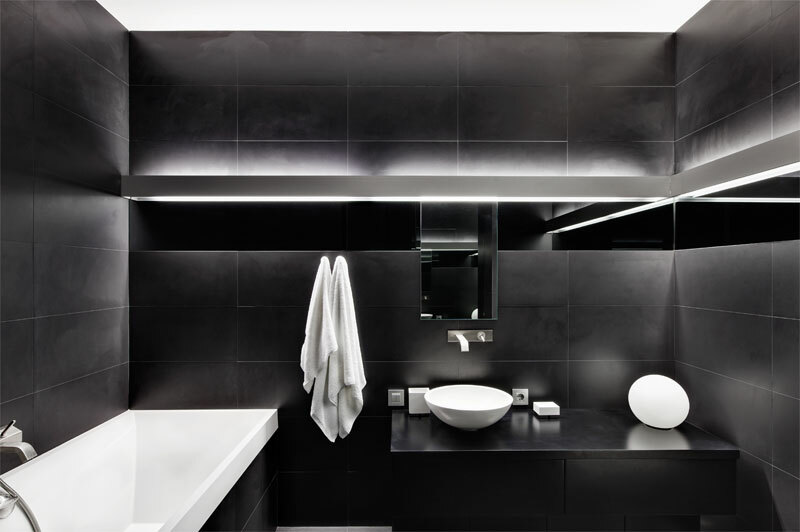 The best bathroom design will be one that’s well-lit with multiple lighting sources: task lighting, accent lighting, ambient lighting, decorative lighting, etc. This is to highlight all the beautiful features and fixtures you’ve chosen, as well as to make the bathroom a fully functional space. Once your basic remodeling plan is in place, all that’s left to do is demo the old components and install the new ones. Whether you take on the project yourself or hire a contractor is up to you. Either way, though, expect some transition time between your old design and your finished bathroom. When you’re remodeling a master bathroom and are looking for great bathroom ideas to incorporate, come to Modern Bathroom! As the web’s leading resource for factory-direct pricing on bathroom components, we’re here to give you everything you need for your new space — at low prices that can save you up to 70 percent off remodeling costs. Browse our site to get new master bath ideas, and find everything from a new vanity to a glass enclosure for your shower. Whatever the scope of your remodeling project, we are the one-stop destination to get the products you want. The bathroom is filled with opportunities for tile: the floors, the shower walls, a backsplash at the sink, the wall behind the sink, etc. Whether you’re updating the entire bathroom or redoing the floors in a half bath, you’re bound to think about tile — and, by extension, grout lines. Whenever you install tile, you need grout. What color should you choose? Is it better to go with a color that matches the tile or a color that complements it? To help answer these questions and guide your bathroom grout choices, here’s a look at how to select the right grout for your bathroom space. Match the tile. A grout color that’s the same color as your tile — whether that is beige, brown, white, black or blue — will make the room feel larger. Because the grout blends with the tile, it visually expands the look of the tiled area. Complement the tile. A coordinating grout color can help highlight your tile choice without too significantly breaking up the look of the area. Contrast the tile. Pairing, say, a dark gray grout color with a bright, white tile is a great way to draw attention to your individual tiles. Contrasting grout colors tend to make tiled areas look busier and smaller, which may or may not work for your bathroom — depending on your desires. White tile and white grout. White on white creates the illusion of one cohesive surface. This popular combination doesn’t catch the eye like contrasting grout lines and tile. Yet it works beautifully as a background when you have other elements you want to stand out. In a bathroom that’s already got a dramatic flair, white tile and white grout keep the focus where you want it. Likewise, this combination is ideal when you’re trying to maximize space in a small bathroom. White tile and gray grout. Using gray grout with white tile is another classic choice that focuses more attention on the shape and arrangement of your tiles. This choice is great for making the tile more of a showpiece. Soft gray does this without over-focusing the eye on the tile. It highlights the shape and pattern of the tile, without making the grout the main feature. White tile and black grout. Using black or dark grout with white tile highlights the grout. The arrangement of the tiles becomes much more noticeable in the bathroom space. When using this trendy combination in the bathroom, you typically will want to use more muted elements in the rest of the design — letting the tile become the focus without cluttering the look. Black tile and dark grout. Compared with white tile, when you’re working with a dark tile, the rules for combining with various grouts reverse. With dark tile, dark grout will create a softer, more seamless look, and light grout will highlight the tile pattern. A colorful grout option. Say you’re using a light-colored tile and want to make it look unique. A colorful grout color — yellow or green, for example — can go a long way toward adding interest. While less common, colorful grout can often feel more fun and whimsical, and it’s definitely a bolder choice. Generally speaking, white or light grout isn’t as forgiving of discolorations and staining, and ends up requiring extra upkeep to make it look good. Darker grouts, on the other hand, can hide typical stains better, but they’re more likely to fade or stain from cleaners. In both cases, properly seal your grout lines to help protect them from staining and make maintenance simpler. To clean grout, try scrubbing with oxygenated bleach, a commercial grout cleaner or a coarse brush. Ultimately, the choice of what grout to use is personal. To make the best pick for your space, browse lots of photos, consider what you like and what you’re hoping to accomplish with the tile. Then, go with what works for you. To find all kinds of bathroom products at factory-direct prices, visit Modern Bathroom. We offer everything from vanities and faucets to showers, mirrors and storage pieces. Contact us today to learn more! When you think about all the daily activities that happen in the bathroom, it’s easy to see why dimmable light fixtures are an asset. Use bright lighting for getting ready and mood lighting for an evening soak in the tub. Dim to a night-light setting when you go to bed at night. With dimmable light fixtures, it’s easy to control your bathroom lighting to suit you. Another modern feature that’s a great bonus in the bathroom is LED lighting. With LED lighting, you have energy-saving advantages such as less heat, a longer lifespan and no toxic materials such as mercury. Even better, the Chromatherapy shower features LED lights with changing shades that bathe you in soothing colors to relax and rebalance. Add a mirror to your shower design, and you gain a convenient tool that makes shaving, scrubbing and other tasks simpler. Even better is the kind of mirror that resists corrosion, works against fog and includes a light. Love singing in the shower? Take your music to the next level with water-resistant shower speakers that pump your favorite tunes into your space. Imagine catching up on news and weather updates all while running through your morning bathroom routine. With a TV in the vanity or shower, it’s entirely possible. This modern marvel puts the TV right into the vanity mirror or the shower mirror, so you can watch your choice of programming while you get ready each day. Add a steam shower to your bathroom to create a spa experience at home. When you soak in the steam, you open your pores, relax your muscles and enjoy the ultimate in bathroom luxury. If a long soak in a tub is your idea of relaxation, you’ll love exploring all the modern options for bathtubs today. From massage tubs with touch controls to ergonomically designed soaking tubs, contemporary features offer spa-level quality and therapeutic comfort. Obviously, a toilet is a necessity in the bathroom — but, thanks to today’s tech features, it’s also a potential focal point. Modern toilets include options with automatic open/close lids, touch-free flushing, air-purifying systems, dry systems, heated seats, bidets and more. 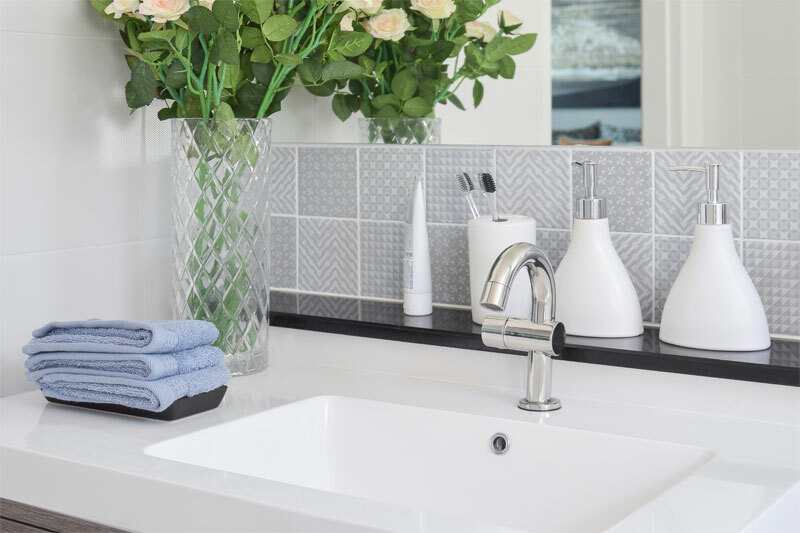 Whether you’re looking to update your bathroom or create a modern bathroom space from the ground up, consider some of the latest technology features that can spice up your space. Draw inspiration from the ideas above, and make your bathroom even more of a standout! In most bathrooms, the shower and the tub are the biggest and dirtiest components to clean. By starting with this area, you can knock out the hardest project upfront. Start by removing any hair from the drain. Then, thoroughly scrub all surfaces from top to bottom with a circular motion, and wipe everything with a damp cloth. Finally, polish any handles, fixtures or shower doors. Spray a light mist of glass cleaner on the mirror, wipe it with a clean cloth, and buff the glass to have no streaks. Clear the sink and counter completely. Then, use dishwashing liquid or all-purpose cleaner on the sink, scrubbing and rinsing with a damp cloth. Last, buff the faucet and fixtures with a clean cloth, and return the products to their places. Scrub the inside and outside of the toilet. Spray disinfectant inside the bowl, and let it sit. After 20 minutes, use a toilet brush to remove stains. Clear everything from the floor, sweep or vacuum it and, when you want to deep-clean it, scrub the floor thoroughly. Get a bucket filled with soap and water, and use a sponge to scrub the floor from one side of the room to the other. Take out the trash, spray the inside and outside of the trashcan, and replace the bag. Wash and dry your towels, and replace with clean ones. Take everything out of the vanity and/or medicine cabinet, wipe the shelves and drawers, and return everything to its storage spaces. Likewise, polish the knobs or pulls. When you’re done cleaning the bathroom, double-check your paper supply and restock toilet paper to equip the room. There’s no magic formula to cleaning a bathroom, and re-arranging some of the tasks listed above may work best for you. Whatever order you complete the tasks, make sure you check off each one to get your bathroom fully clean.